What do Wau and Nova Iguacu in common? They are both affected by (armed) conflict and Perspectivity was asked to facilitate multi-stakeholder dialogues to reflect and plan for action. Lisette has been facilitating these processes, which only give a small insight into the broad work the 9 enterprise colleagues are realizing together. 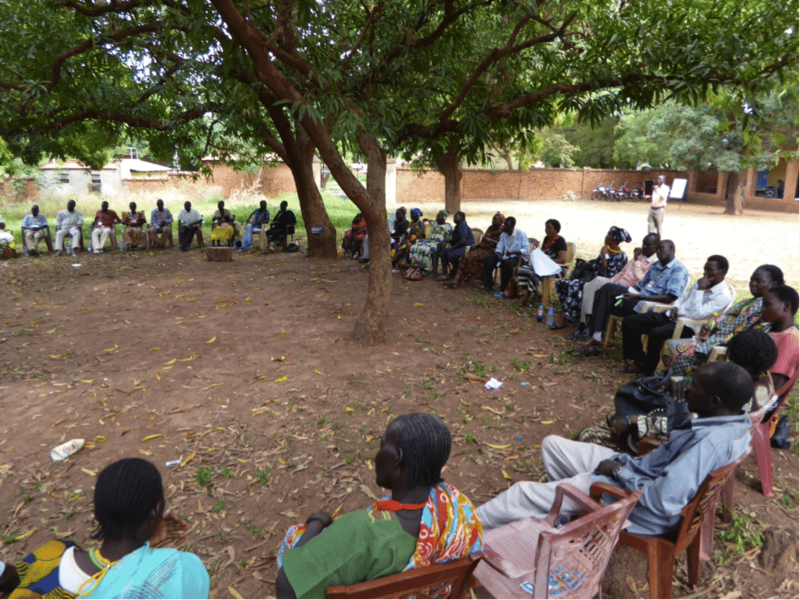 In Wau (South Sudan) Perspectivity worked on the implementation of Cordaid’s Barometer for Local Women’s Peace and Security together with its partner, Women’s Development Group. First, a training was organized to train a group of five facilitators in the Future Search methodology and principles. After the training a multi-stakeholder session with over fifty participants was facilitated and the trained women took over a large part of the facilitation and were coached on the job. This workshop was empowering in many ways, especially the power of self-management, over the three days the newly trained facilitators were kindly reminded to let the participants do everything themselves, including getting their own flip-charts, organizing the room and being back on time. Besides that impact, it was the women from the community that expressed that the diversity and great number of participants are crucial in these processes. It was only a first step in a long process of the implementation of six small projects plans, which include the training of police forces in the gender based violence, the plan to start basic education for women in the communities and to start monitoring the issues of women in communities and raise their collective voice and improved peace and security. The process is followed up by Women Development Group and accompanied by Cordaid. It was a very exiting and constructive first step. In Nova Iguacu (Brasil) Perspectivity was requested by AVICRES and Kindermissionswerk to facilitate a developmental evaluation for the work implemented in the so-called favelas. In the favelas people live in extreme conditions and armed violence is common and widespread. For the assignment we used Appreciative Inquiry as an approach to facilitate AVICRES to go through an intensive learning and reflection process. The recommendations at the end of the week focused on the training of the management, the revision of age of the target group by AVICRES and training of the personnel of the implementation of the vision of AVICRES. When an organisation formulate their own recommendations they are closest to the next step the system can take and most likely to be taken up by the organisation after the evaluation has been concluded. The work with AVICRES has been inspiring, especially because it’s a strongly value based organisation, something where Perspectivity Enterprise and AVICRES are alike.